Long ago, the pharaoh Nephren-ka governed Egypt with such malice and cruelty that his own people eradicated all evidence of his reign. Now the Brotherhood of the Beast has uncovered the truth and conspire to return the Dark Pharaoh to the throne, dooming Egypt, and all of humanity, to an age of wretched slavery. You and your fellow investigators must make haste to Egypt and brave its most secret and haunted places to put a stop to the cultists and ensure that Nephren-ka remains forever in his torpid slumber. 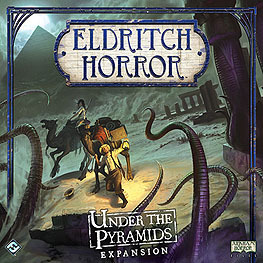 The Under the Pyramids expansion features an Egypt side board enabling investigators to explore the nation's bustling cities, barren deserts, and mysterious archaeological sites. Eight intrepid new investigators join the struggle against the Ancient Ones, aided by invaluable Relics, powerful Glamour Spells, and legendary allies including the archaeologist Enoch Bowen and the illusionist Erich Weiss. Unprecedented wonders and horrors await you under the pyramids by the shores of the Nile!